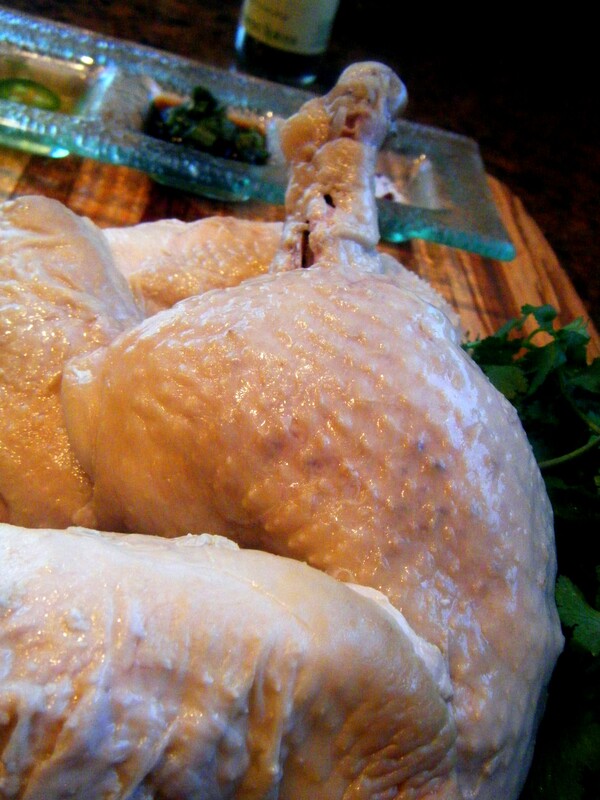 Take a whole chicken, 3 to 4 pounds, and remove the giblets. In a deep stock pot fill with enough water that will cover the chicken. Into the water slice a 3 or 4 inch piece of ginger. No salt. Bring water to a boil. Add in the chicken. Bring back to a boil and boil for 10 minutes. Reduce heat to a simmer and cook for another 20 minutes. Turn off the heat and allow to cool in the stock for at least 5 or 6 hours. This can even be done the day before, just don’t refrigerate it. Really. When it’s time to sup, cook up a pot of rice. While that’s simmering away, mix the spices for serving. Original inspiration for these are from Rick Stein’s Food Heroes cookbook. 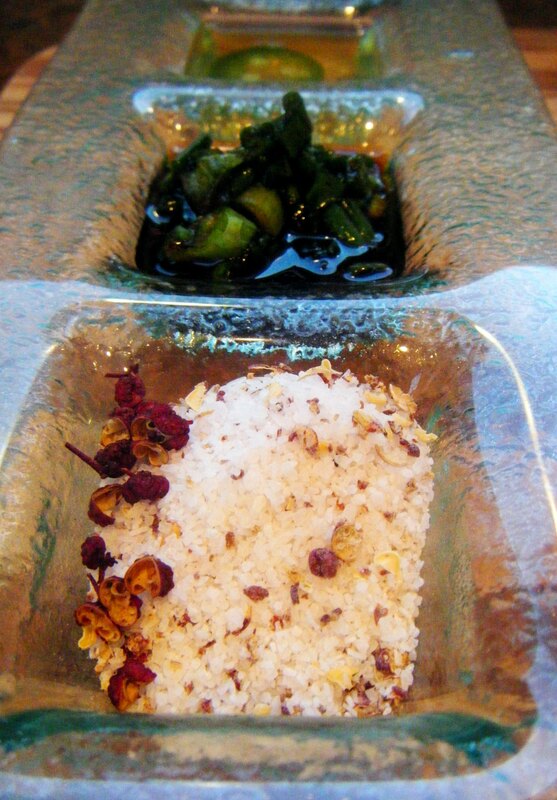 In a small bowl combine 1/4 cup rice wine vinegar and slice a small hot chili into it. In another small bow, mix 1/4 cup soy sauce and a sliced green onion. In a third bowl combine 1 tablespoon kosher salt with 1/2 teaspoon of finely crushed Szechuan peppercorns (use a mortar and pestle if you have one or use a knife to chop very finely). To serve, remove the chicken from the stock and joint it, though it will be decidedly easier, as this chicken is already cooked. Serve the chicken family style on a platter along with a bowl of the hot rice, the seasonings and cilantro and lettuces (iceberg is cold and crispy and nice with this). Everyone can add their own amounts of each different spice to the rice and chicken. I love the onion and soy, but think the spicy vinegar is just as important. PK tip: If you can, give those Szechuan peppercorns a try. They are so unusual as the heat or spice from them is strangely numbing, you just a need a tiny bit. This is one of those meals that the end result is greater than the sum of its parts. Playlist included Flathead, by the Fratellis. My trick is how to get a really fresh and organic chicken in the Los Angeles area. I think you are right that this makes a big difference in such a dish. This recipe sounds wonderful. You know, I don’t mind Whole Foods. I think they’ve been pretty good with products. I’m not sure what farms they’re sourcing from out there, but around here, the stuff’s been really nice. The challenge will be for my husband to try “room-temperature” chicken… The girls and I don’t have an aversion to warm or room-temperature food, but my husband is fanatical of food being HOT. Then he sits at the table blowing on his food saying, it’s TOO hot. Thanks for the recipe! In my mind I’m thinking ahead… should there be leftover chicken and stock – how delicious a rice gruel (okayu) would be with rice simmered in the stock, seasoned with a little salt, white pepper, perhaps some left over spices, or perhaps grated ginger and chopped scallion… I covet any leftover stock or pan juices to make another dish. Thank you for the lovely recipe! I did something very similar with the leftovers. I had leftover rice and combined it with the stock, some chicken, and some soy and sriracha. Made the best soup in a pinch. Thanks for the details on other dishes. I look forward to all your comments! I confess. I make a hotpot (nabe) for dinner, often. It’s quite easy – I have a literal “nabe” which is a pot that is more flat than tall (I’d say the diameter fully covers my largest electric burner) that I cook shabu shabu, yu-dofu, buta-shabu – the Japanese winter hot-pot medley! I fill the pot with water, and add a generous piece of dried konbu, or kelp, and let it slowly warm up. A handful of dried shiitake mushrooms. Then I add a cresent’s width of chopped greens (watercress, napa, spinach, whatever you have on hand! ), a container of House Organic Tofu cut into 16ths, sliced carrots, sliced bamboo shoots, House shirataki (or frozen udon noodles – but at the END if you are making meat balls) and bring everything up to a slow boil. At home, I’ll either have pre-sliced meat (“shabu shabu beef OR pork”) or I’ll make last minute meatballs to be added to the boiling hot pot of ground turkey (or pork), minced garlic, scallions, ginger – and any other ingredient I can sneak in. Sometimes, flax seeds, sesame seeds, chopped cooked kale/spinach. I quickly mix the meat mixture together, and drop small meatballs (spoonfuls) into the boiling stock. This is a great winter meal for my family – they love the veggie, tofu, meat-o-ballie, and noodle aspect of the meal. I think I crammed too much data into your comment section before I could get to the secondary meal part. I take the broth, and add a cup of cooked rice, and let it slowly simmer. Add beaten egg, and mix in – to have a soupy risotto intertwined with shards of cooked egg. At our house, add minced scallions, a little grated ginger, and season with soy sauce to taste. A teaspoon of sesame seeds, or even flax seeds adds crunch. PS. Other times, I add frozen udon noodles, or tofu shirataki, let it cook in the stock, and at the end, add a beaten egg to cook. You are amazing! I love your comments. I always feel so grateful that you share what you’re cooking and how you do it. I love to hear about how folks cook at home, and you are especially interesting with your background and upbringing! Thank you! Every home from different countries has their own version of chicken rice. Fantastic! Yeah, whole poached “white” chicken never looks good on serving plate! 🙂 But it tastes good and natural when it is very fresh! It’s one of those that may not be the prettiest thing in the culinary world, but it tastes fantastic. Thanks for stopping by and commenting!